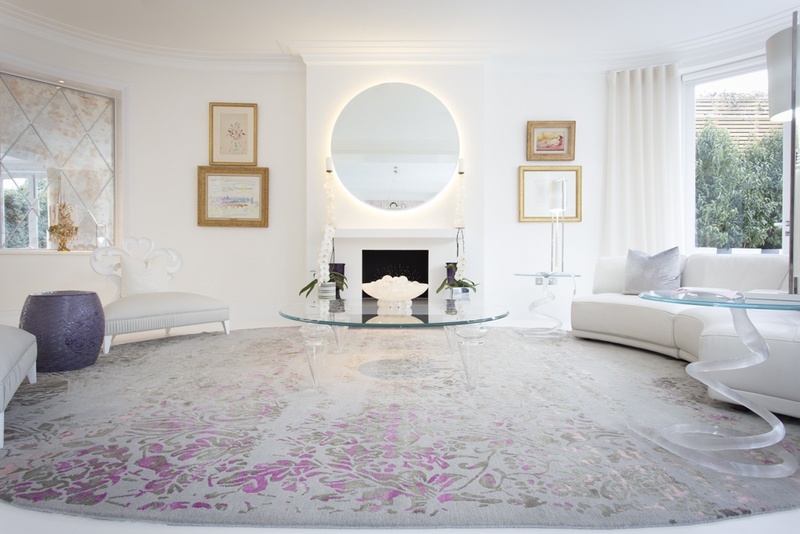 At Bazaar Velvet, our aim is to match each client with their ideal rug. Despite the large inventory of rugs available in our showroom, sometimes our clients require something very specific, custom made to their space. We take on projects large and small, but nothing delights us more than being able to decorate a whole home with beautiful bespoke rugs. Our design team work closely with interior designers and home owners alike to make their vision a reality. Here are two beautiful projects we have completed in the past year, completely transforming homes with stunning hand knotted bespoke rugs. This November, we completed a project for a lovely couple from Hampstead looking to furnish their new home. They had been in the house several weeks, gradually adding pieces of furniture and decorations to the blank canvas of their new-build. However, after a time, they came to realise that there was still something missing. The rooms seemed cold, empty, and lacking in character. What they needed were some show stopping rugs. The couple came to our showroom fully prepared with the sizes of the rugs they required for each space, photos of their existing furniture and a vision of what they wanted to achieve. We began with looking through our stock pieces to show the quality of our product and to provide inspiration, before focusing on our design portfolio of elegant geometric designs. 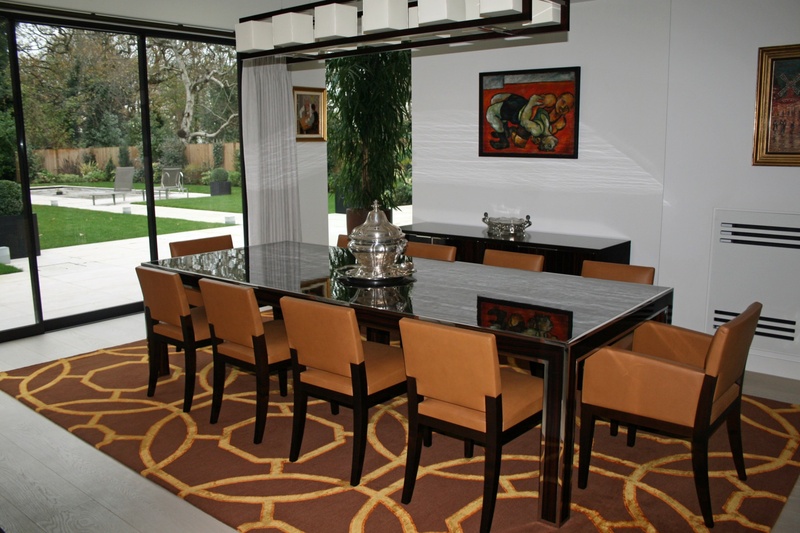 These rugs fitted perfectly with the modern clean lines of the tables and chairs they had already purchased. The next step was to recolour the designs, using a combination of on-screen visualisations and wool colour tufts. The beauty of this is that colours can be picked out from various different elements of the rooms, from artworks to fabrics and accessories. We would see these advantages for ourselves when we visited the client in 18 weeks time, with their new bespoke rugs. When we first entered the property, we were struck by a beautiful glass staircase, which punctuated a very modern open-plan space. The floor was vast, an expanse of pale wood flooring, and we couldn’t help feeling the place looked a little unfinished, which of course it was. We began in the study, the only closed in room on the ground floor, to place an elegant transitional rug. We then moved to the library, living room, dining room and conservatory. It was wonderful watching the place take shape. 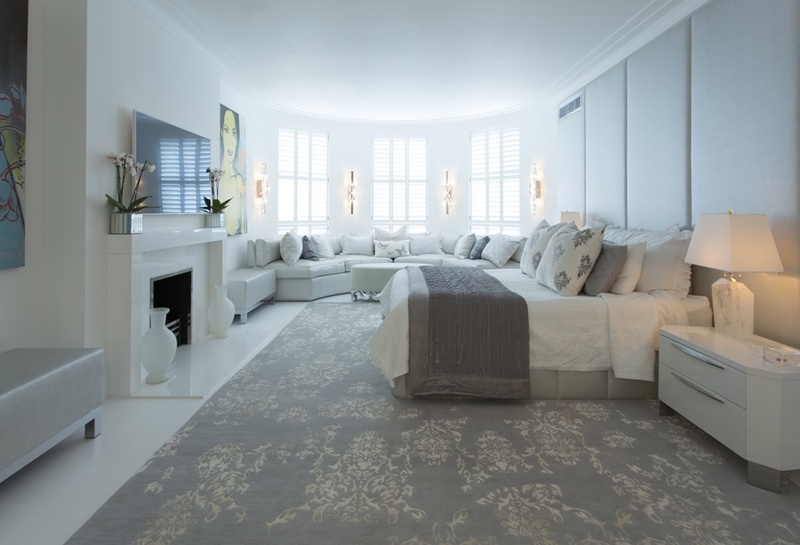 With our help and guidance, the clients had made excellent choices, injecting just the right amount of colour and pattern into their rooms and accentuating their luxurious aesthetic. A stunning transformation. At Bazaar Velvet we have been approached by some of the most exciting design talents in the world. International Interior Designer Stephen Falcke, was one of these individuals, having won several major design awards including the Andrew Martin Designer of the World award. He learnt his craft from The Chelsea School of Art followed by time working under the famous London based designer David Hicks. He now completes both commercial and residential projects across the globe from South Africa to America. However, one of his latest design projects took him much nearer to home, to St. Johns Wood London. This exciting venture involved a major renovation of a gorgeous period home. Both designer and client had a clear vision of what they wanted to create with the space. They required several contemporary rugs to tie in with the feminine aesthetic of the home. Delicate pinks purples and greys were to flow through the whole house, creating a constant sense of tranquility. The style was to be an ingenious blend of traditional elegant patterns and modern minimalistic shapes. The search for a rug began in our extensive stock at the Bazaar Velvet rug store London. Inspiration was drawn from our design portfolio, particularly those we describe as being ‘transitional’. These combine traditional Persian designs with abstract elements. Keeping a close dialogue with the client allowed us to continually evolve designs for the perfect outcome. After alterations and sampling, the client was confident to proceed with the creation of these unique hand knotted rugs. 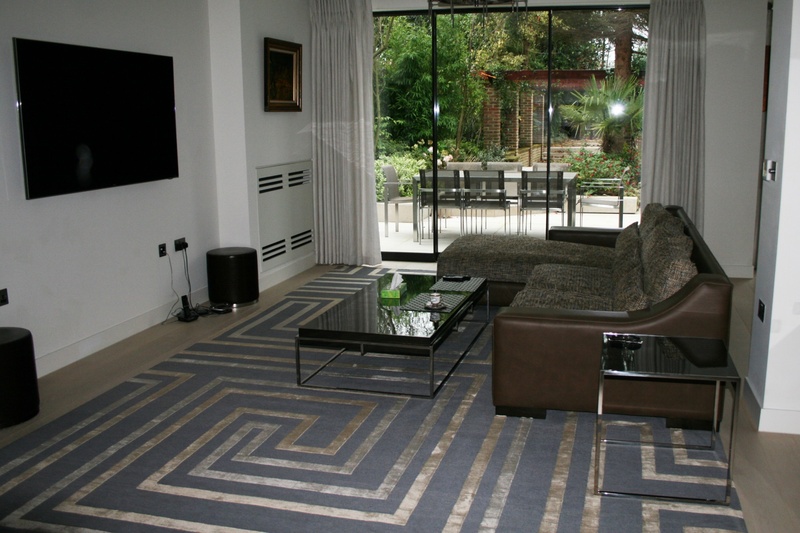 After four months of dedicated hand workmanship, the clients’ gorgeous contemporary rugs were ready to be installed. Perhaps the most interesting of these pieces was that for the main living room. This was partly due to the shape of the room itself, with its gorgeous curved walls. The bespoke rug was created to follow these contours giving a smooth oval shape. The pattern itself was also completely unique. Flashes of pink added excitement to a delicate Oriental floral design, given a slightly distressed look with clever erasing. It provided a focal point for the room, setting a mood of contemporary elegance. All rugs have been a roaring success, their bespoke designs tailored to the interior schemes. Soft accent colours have been reflected, as have the smooth flowing lines of the furnishings. They are a fitting tribute to the talent and commitment of not only Stephan Falcke and the Bazaar Velvet design team, but all who were involved in their creation. 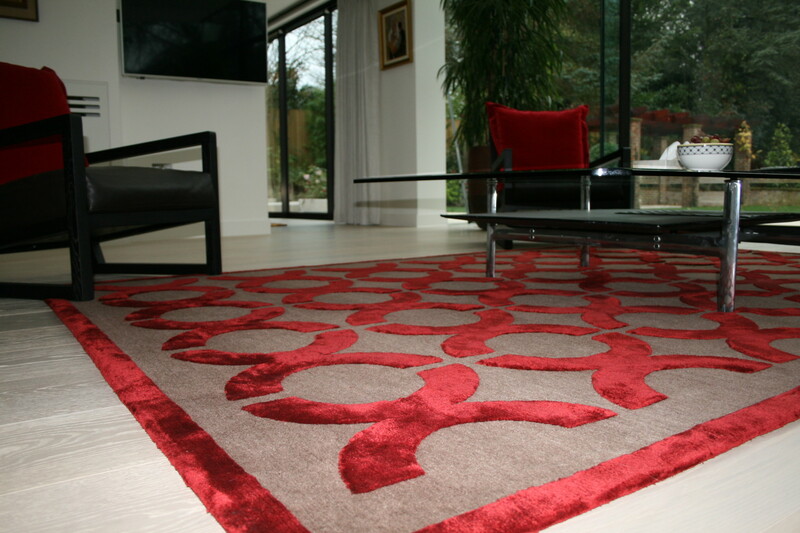 Interested in having a bespoke rug created for your own home? Contact the friendly team at Bazaar Velvet and we will be delighted to discuss your ideas with you.